Pique, a condiment made of fermented pineapple juice and a mix of chilis, adds flavor to just about anything—make it yourself or order it online. Here in mainland America, we’re relying on condiments like ketchup and ranch dressing to liven up bland sandwiches. 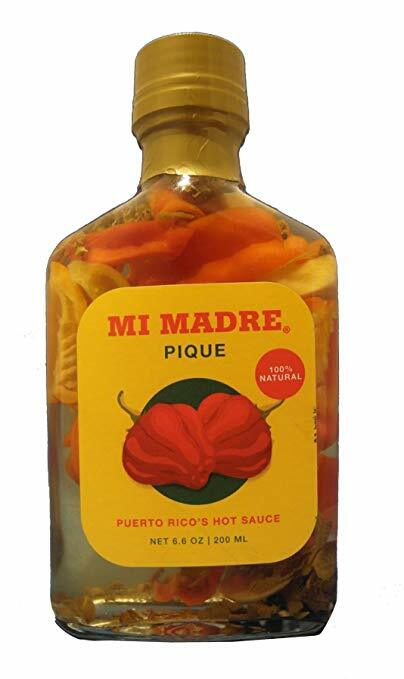 But when Puerto Ricans want to add a pop of flavor to their plate, they reach for pique. The hot sauce, typically made with locally-grown chilis and fermented pineapple juice, has an essential place on restaurant tables and in kitchens all over the island. Juan José Cuevas, executive chef at 1919 in San Juan’s Condado Vanderbilt hotel, makes batches using locally-grown ingredients, inspired by the sauce his grandmother used to make while he was growing up on the island. “Pique was part of my daily diet,” says the chef, who returned to Puerto Rico seven years ago after working in celebrated restaurants from San Sebastian, Spain to San Francisco and New York City. With a thin consistency, the hot sauce is added to everything from bean stew and mofongo to salted codfish (or cheese, octopus, pumpkin …) fritters sold at roadside kiosks. Cuevas says the way to use pique is one dash at a time. You can buy a bottle here, or mix up one of your own by steeping the ingredients in a repurposed glass bottle. (Take a cue from Puerto Ricans and use an empty, cleaned rum bottle.) If you can’t find ají dulces, which come from Puerto Rico and other Caribbean and Latin American countries, you can sub in ripe red bell pepper. Cover the mixture with a cheesecloth, and leave it for anywhere from two to five days; the longer it steeps, the hotter it will be. But, Cuevas warns, don’t put the cap on the bottle before the fermentation process is finished, or risk a pique explosion. Ketchup and ranch dressing have never been that cool.